Emperor Titus has invited all of Rome to celebrate the opening of the new Colosseum with 100 days of festivities and entertainment. Along with about 50,000 others, you have crowded into the arena to see the games. As the action gets underway, the crowd roars with excitement. What do the games at the Colosseum suggest about the world of ancient Rome? Economics A large division between the rich and the poor often creates problems. In ancient Rome, anger arose between powerful, wealthy landholders and poor farmers. This anger led to the development of a more representative form of government. Later, conflict between the two classes would lead to civil war. Background: In 49 B.C., Julius Caesar became the sole ruler of Rome. At first, Caesar was a popular and effective leader. But in time, the Senate, Rome's governing body, resented his power. On March 15, 44 B.C., some of the senators took action. The Senate held a meeting on that fateful day. The senators entered one by one and, finally, Caesar came into the chamber. And then an incredible scene unfolded. Caesar took his seat in the center of the chamber. According to custom, he was the only one allowed to sit. Before Caesar called the meeting to order, the senators talked in small groups. Then one of the men stepped forward to ask Caesar a question. He even grabbed Caesar's shoulder. Angrily, the ruler waved him away, but the senator seemed determined to gain his attention. While Caesar argued with his questioner, another senator moved forward. Silently, he drew out a knife and wounded the ruler with his weapon. Caesar cried out in surprise and rose from his chair. He pulled out a knife from the folds of his toga and defended himself. The senator stumbled backward, but the others moved forward. They all drew out their knives. It was a plot! Caesar made no sound as the senators attacked him. He pulled the hood of his toga over his head and adjusted the garment over his feet. As he fell to the ground, the toga covered his body. When the senators finally stepped back, Caesar was dead. One of the senators ordered a pair of servants to remove the body. The people of Rome would soon learn that their ruler had been killed. No one—not even the senators—knew what would happen to Rome next. 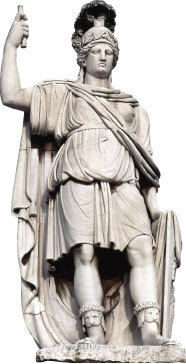 Symbol of Rome - This statue of the goddess Roma represents ancient Rome. Romans believed that the goddess protected them and their city. You have probably seen movies about ancient Rome, with its Colosseum and gladiators. These films show Rome at its height, but they only tell part of the story. The founding of the civilization owes much to its geography. ESSENTIAL QUESTION What is the early history of Rome? The history of ancient Rome begins with the overthrow of foreign kings in 509 B.C. But Romans like to date the history of their city to 753 B.C. That is when a legendary hero called Romulus (RAHM•yuh•luhs) is said to have founded Rome. A legend is a popular story from earlier times that cannot be proved. The legend about Rome's founding begins with Aeneas (ih•NEE•uhs), a hero of the Trojan War. According to the legend, Aeneas settled in Italy after Troy was destroyed. 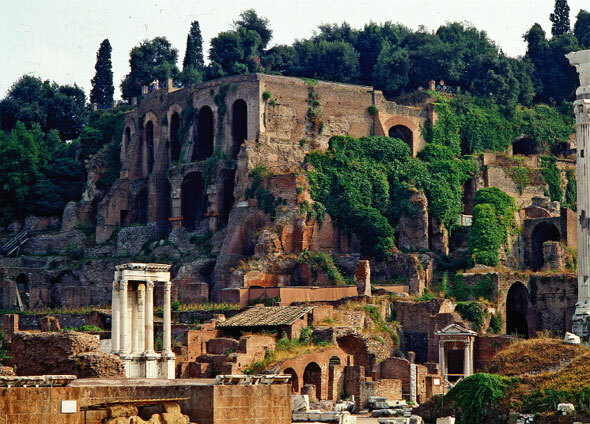 Palatine Hill - Traces of settlements dating from around 1000 B.C. have been found on the Palatine Hill. The legend continues with the twins Romulus and Remus (REE•muhs), the descendants of Aeneas according to some versions. They were abandoned by their mother but rescued by a wolf. When the twins grew up, they decided to found a city but fought over its location. 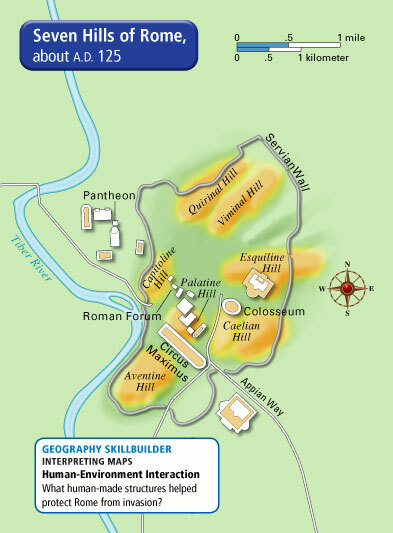 Romulus killed his brother and traced Rome's boundaries around the Palatine Hill. After Romulus, a series of Roman kings ruled the city. Sometime in the 600s B.C., however, the Etruscans conquered Rome. The Etruscans were a people from northern Italy. But the Romans wanted self-rule. In 509 B.C., they overthrew the Etruscan king and formed a republic. A republic is a government in which people elect their leaders. ESSENTIAL QUESTION Why was Rome's location so favorable? After the overthrow of the Etruscans, Rome grew from a city into a country and then into a vast empire. Its location helped make this growth possible. In reality, people founded Rome, not figures from legend. The first settlers of Rome were the Latins. They came from a region surrounding Rome. They chose the spot for its mild climate, good farmland, and strategic location. The Latins and later settlers built Rome on seven steep hills. (See the map below.) During the day, settlers farmed the fertile plain at the base of the hills. At night, they returned to their hilltop homes, from which they could defend themselves against an enemy attack. Rome had other advantages. It was located a short distance from the Mediterranean Sea on several ancient trade routes. It also lay next to the Tiber River. 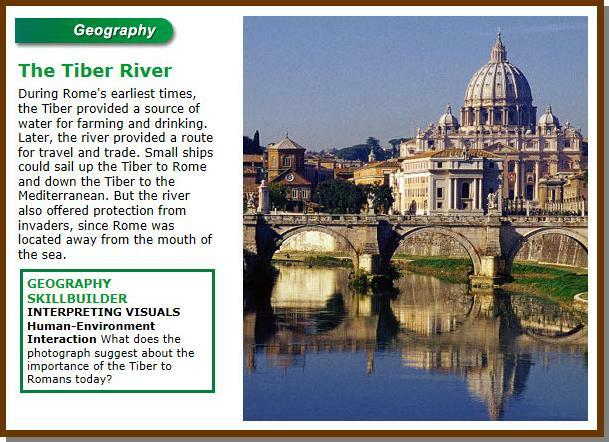 As you learned in the Geography feature above, this river played an important role in Rome's development. Rome's location on the Italian Peninsula also played an important role in its development. The peninsula stretches south from Europe into the Mediterranean Sea. A peninsula is a piece of land surrounded on three sides by water. The Italian Peninsula is shaped like a boot. Its heel points toward Greece, while its toe points across the sea to Africa. Italy's location on the Mediterranean made it relatively easy for Roman ships to reach the other lands around the sea. 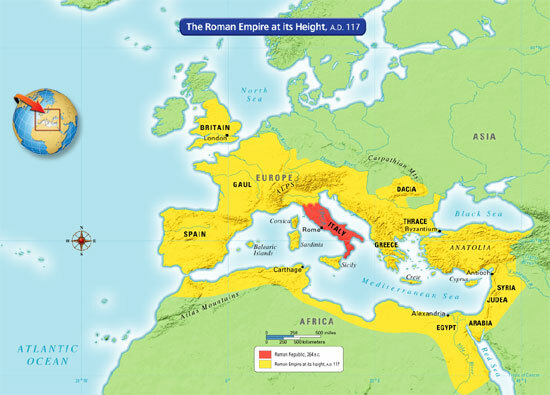 This position made it easier for Rome to eventually conquer and gain new territories. It also helped the development of trade routes. The two main mountain ranges of Italy helped protect Rome. The Alps border Italy on the north, and the Apennines (AP•uh•NYNZ) form Italy's spine. But Italy's mountains didn't separate early settlements the way the mountains of Greece did. Italy also had more large plains than Greece. This made farming easier. ESSENTIAL QUESTION What was life like for the early Romans? Like many ancient peoples, the early Romans lived by farming. But even though the land was fertile, life on a Roman farm was not easy. Most early Romans worked small plots of land. They planted grains such as wheat and barley. They also grew beans, vegetables, and fruit. Later they learned to grow olives and grapes. They also raised pigs, sheep, goats, and chickens. They used oxen to pull their plows. Farmers who owned land also served in the army. In fact, for a time only landowners were allowed to join the army. Roman leaders believed that property owners would fight harder to defend the city. Landowners were also able to pay for their own military equipment. Over time, some farmers grew richer than others. They bought more land and built larger farms, or estates. A gap developed between small farmers and the owners of the estates. This gap would later produce divisions in Roman politics and government. At first, most Roman farmers lived in simple homes made of mud or timber. They did not have much furniture. In addition, the farmers lived in extended families. This large family group might have included grandparents, aunts and uncles, nieces and nephews, and cousins. Italian Farm - Grapes, like these shown here, are still a popular crop in Italy. 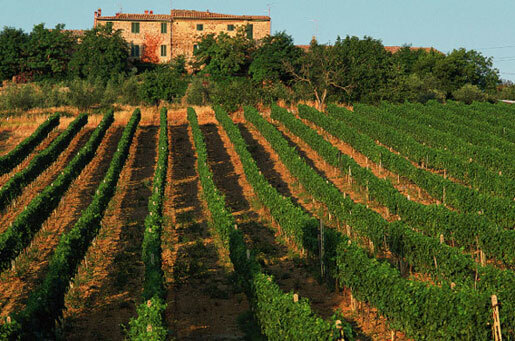 In ancient Rome, only wealthy farmers, who could afford to wait a few years to harvest the first crop, grew grapes. The members of a Roman farm family had to work very hard. They farmed the land with simple tools and fetched water from a well or nearby spring. The small amount of land on most farms had to produce enough food to feed the family. This meant that everyone had to be disciplined about his or her responsibilities. The qualities of discipline, loyalty, and hard work that these early farmers developed would help Rome succeed. They were the qualities that made Roman armies so successful. When soldiers went to war, they had to obey orders and do their jobs. This attitude would help Rome conquer all of Italy. Legend and fact shaped Rome's early history. Rome's geography encouraged the growth of Roman civilization. Roman society benefited from the hard work and discipline of Roman farmers. There are still many cultural connections among Mediterranean areas of Europe, Asia, and Africa as a result of Rome's influence.